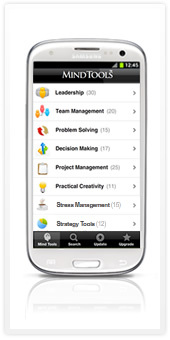 Learn more than 100 management, business and personal productivity skills from the MindTools toolkit. Build useful skills whenever you have a spare moment. Skill types include leadership, team management, strategy, problem solving, decision-making, project management, time management and personal productivity, stress management, communication, creativity and career development. Access more than 100 concisely explained tools that make you a better boss. This is a free, fun and inspirational app. You’ll find everything you need in a couple of taps. Just choose a training topic from the list to see all the relevant tools. Every training tool explains in plain, short and simple language what you need to do to improve. Perfect for those spare few moments while you’re waiting for a train! If you’re in a rush, check out the compressed summaries at the end of each topic. These give you the bare-bones pointers for improving a specific business skill. Get this business app today and start your way to learn various business skills for free. You can get it by clicking on the button below. You like this? Share with others, they will find it useful.